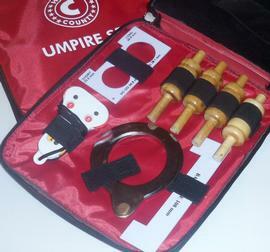 This is a handy set of items for any cricket umpire. An umpires counter with three dials - overs bowled and deliveries bowled. Each item is held in place by sturdy elastic holders. The pouch measures 25cm x 26cm x 2cm approximately.